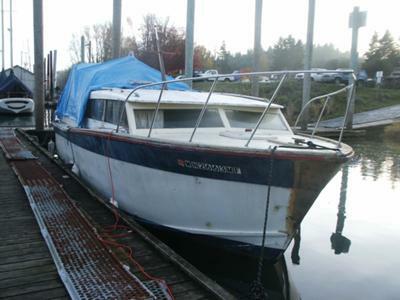 My boat is a 31' Fairliner built in 1962 by Western Boat Builders in Tacoma Wa. I bought it in January this year for a song. It is in very rough condition and was briefly sunk but the hull seems to be sound and I think the engines are salvageable. At one time this was a beautiful boat. The superstructure, decks and the upper hull (probably the whole hull) are solid mahogany. I won't be able to restore most of it to the original finish because of patches and the cost of mahogany. The interior is mostly solid mahogany with some veneer panels and will restore very nicely. This is a long term project and I might not live long enough to finish it but I am having the time of my life working on it. I have never tried anything like this before so if anyone has suggestions I welcome them. Back in the 80's I had a 25 Ft. 1962 Trojan while my dock buddy across from me had what looks like the same model and year Fairliner, named the Satin Doll. That boat had an awesome sheer line and the raised coaming surrounding the back deck was nice looking too. Nice to see one being restored. I had a 25 ft fairliner which became too much of a project for me so I scrapped it. In the process of working on it I found that a chris craft stain was the perfect color for the cockpit interior. Hello I think you have about the same size of boat I have, a 30 feet long and 3 m wide. I also have a lot of mahogany wood broken or damaged. So, I asked around and I am going to use plywood, protect it with West system epoxy and then on top glue a thin 1-2mm max thickness of mahogany to get back both the look and the feeling. It?s good to hear that you have managed to get some work done despite the weather. I was planning to cross some of those to-do-jobs off my list this weekend but as I write this it?s snowing again out there. It sounds as though Finley's (non) Folley?s interior is really coming on. You will have to let us see some photos of your good work. You can email them to me at, mike@diy-wood-boat.com, as attachments and I can put them on your original post, if you like. I have the boat out of the water now but the weather has prevented me from working on the exterior or engines. I have been working on the cabin interior refinishing the mahogany. I have completed about 60 percent of the trim in high gloss polyurethane and despite the less than optimal conditions it looks great. My varnish is "Circa 1850". Because of the lowered temps I have been thinning it with about 20 percent mineral spirits. I have some satin interior varnish coming which I will use on the panels to provide some contrast while still showing off the mahogany. Thanks for telling us about your project Dave. I just love to hear about such lovely boats as yours being rescued. As for advice, it sounds as though you already have the main ingredients for success. You have had the courage to get started and you are enjoying the work. If you have any specific questions don?t hesitate come back and ask. And please come back and let us know how you are getting on.